Photo by Jerome Davis Looking for his A-game: shortstop Jason Bartlett has to refine his game in Rochester. The Twins called up Red Wings shortstop Jason Bartlett on July 27 for his first big-league stint when utility infielder Nick Punto broke his clavicle. Bartlett, 24, played in two games against Anaheim but he struggled, going 0-for-5 and committing two errors. Minnesota sent him down on August 6. In Rochester, Bartlett hit .339 before breaking his left wrist in May. He returned to the lineup in mid-July and hit .312 as of August 16, when the Wings were 10 games out of first in the IL North and four games out of the wild card playoff spot. This is the third installment of an occasional series chronicling Bartlett's season, as told to Mike Doser. It was amazing to go up to the Twins. The biggest thrill was living out that dream ever since I was a little kid, and finally making it to the top, stepping on that field in front of 30,000 to 40,000 people, and playing against Boston's Pedro Martinez and Curt Schilling --- the superstars. That's just the biggest shock. Once I got used to that, it's just baseball, the same game we're playing down here. Red Wings manager Phil Roof was the one who gave me the news. He called me on the cell around 11:30 p.m. [July 26], and said, "You're going to the big leagues." So I had to come home and pack, then leave for the airport around 6 a.m. I didn't finish packing until 3 a.m., and by that time, my adrenaline was running and I couldn't get to sleep. I was calling my family and friends, trying to get tickets for them to come out and see me. And I was trying to pack all of my stuff and take care of my bills. It was really hectic. I didn't forget anything. Actually, I left a lot of bills for my roommate, pitcher Jesse Crain, to send out, but then he got called up, and now I'm back down here, so I can take care of it. That's kind of funny. The rent assignments are messed up. Pitcher J.D. Durbin is now living in Crain's old place, which was my old place. Pitcher Beau Kemp took my place there too. And I'm living in pitcher Matt Guerrier's place right now. He's in Minnesota. It's part of the lifestyle. I understood my role when I got to Minnesota. They said shortstop Christian Guzman's back was bothering him, so I was going to give him a day off now and then. But his back was feeling fine, so I started just one game and got into another. As much as I had fun up there being on the bench, I need to be down here playing. But I saw what it was like and got the butterflies out of the way. I wish I could have performed a lot better. I need to refine my game in Rochester, and show the people up there I can really play. I have to work on a couple of things, such as defense --- catching the ball everyday and making the routine plays. When I got sent down, Twins manager Ron Gardenhire called me in his office and told me they want me playing every day. I understood where he was coming from. 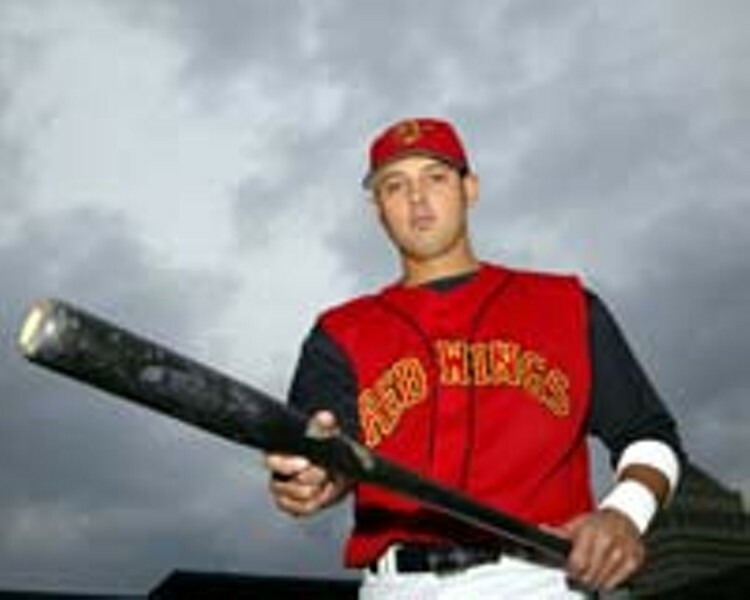 They swapped me for Red Wings utility infielder Augie Ojeda who can play once a week and play any infield position. But overall, it was a great experience. And I like the Metrodome field over Frontier. I pretty much like any field over Frontier. Frontier's a great stadium --- one of the nicest stadiums I've seen. But they play soccer on it and they try to fill the holes up with sand and rocks, that's just not a very good combination. I made some good money up there, too. When a player goes up, he gets paid on the Major League minimum pay scale of at least $300,000 per season. It's nothing like being in Triple-A. Don't get me wrong, just playing up there was a dream come true, but money just makes it even better. I didn't really reward myself by buying anything extravagant. I'm going to be smart about it. During the first few days, Twins first baseman Justin Morneau and I went to the mall in anticipation for the road trip to Seattle because I needed some dress clothes for the plane. Morneau took me to Nordstrom and made me buy some expensive clothes, so I dropped a lot of money on that stuff. Players don't have to wear a suit, just a nice shirt, slacks, and dress shoes. Down here I think I only had one of each. When we fly as Red Wings, we have to wear collared shirts and slacks. It's a job and we have to look professional. Speaking of Rochester, the team has struggled some, and I said something to the media recently I shouldn't have: that we're depressed. But no one's depressed. We're giving it 100 percent. Right now, maybe guys are trying too hard. For instance, there might be runners in scoring position and we're trying to get the guy in by swinging at bad pitches. We're not talking about the playoffs right now. We're just talking about winning ball games and seeing what happens in the end.